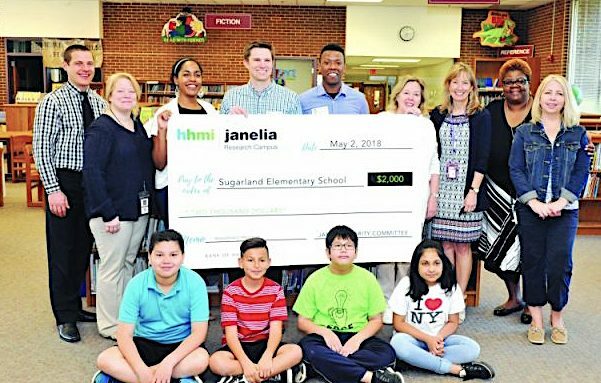 Dawn Meyer and Lynn Rubin from the Loudoun Education Foundation, Mike Perham and Monti Mercer from HHMI Janelia Research Campus, and Sugarland Elementary School administration, faculty, and students take part in the grant presentation May 3. A bit of Howard Hughes Medical Institute’s Janelia Research Campus will soon be in six Loudoun County schools. HHMI has donated more than $11,000 to the Loudoun Education Foundation and Loudoun County Public Schools to help create makerspaces in six schools. The following schools have received the grants: Meadowland Elementary School, Sugarland Elementary School, Sterling Elementary School, Trailside Middle School, Seldens Landing Elementary School and Horizon Elementary School. Most of the makerspaces will be in the library, providing an area for students to create, invent and learn. The makerspaces will include 3D printers, Promethean tables, arts and craft supplies, brain games and Legos.